First on the list is the rather gorgeously packaged White Tea Tinted Veil Moisturiser (£19.00) – This tinted moisturiser is infused with calming White Tea and Pomegranate extract to pamper and protect, and it also includes Vitamins A, & E nourish the skin. 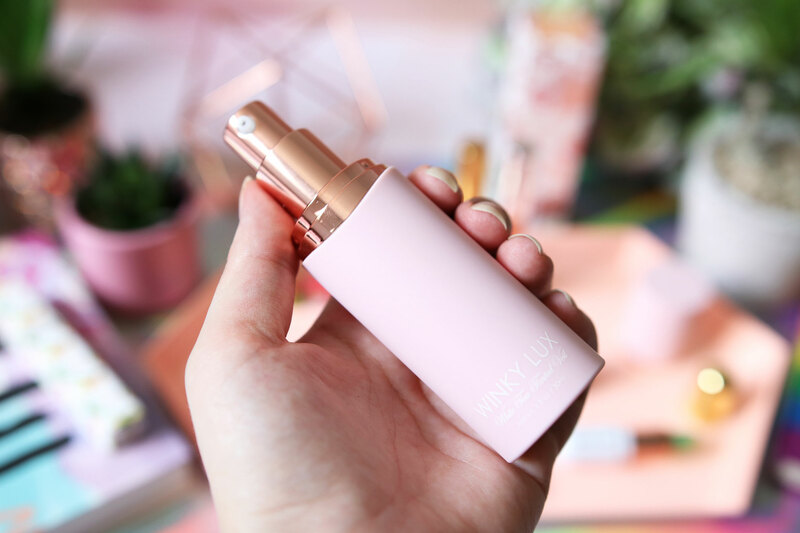 It has a lightweight formula, that provides a sheer hint of colour as well as protecting from UV rays with broad spectrum SPF30. 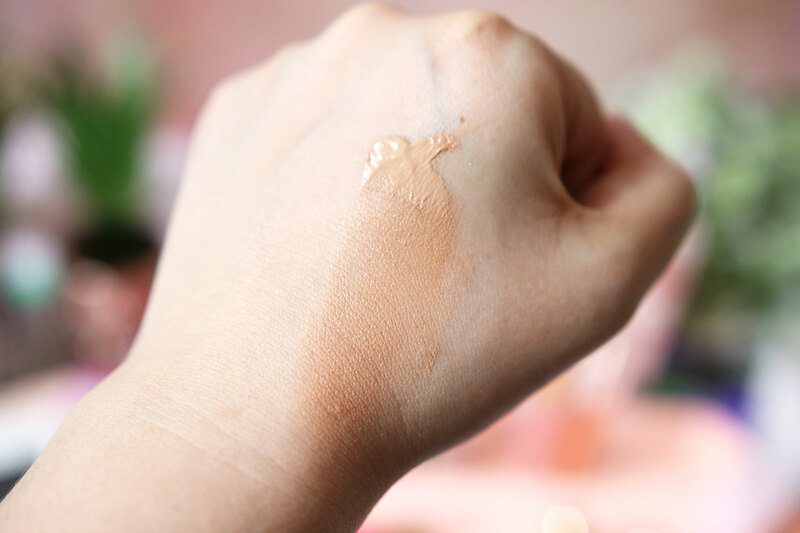 Though this is a moisturiser, it gives coverage more light a light foundation. The finish is natural looking and perfect for the current hot weather. It comes in 5 shades, and I have Medium which is a little on the dark side for me, but I know it’ll be perfect for when I (if I ever) get a tan! 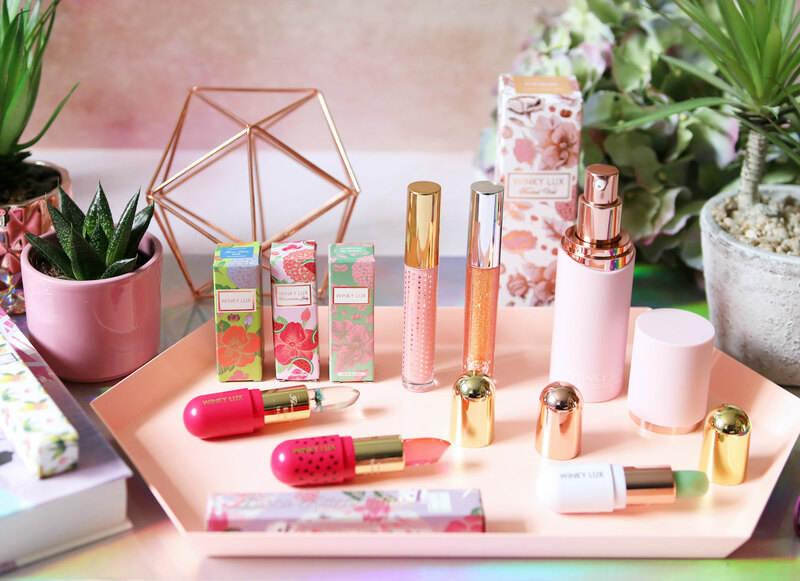 I also have the new Pucker Up Lip Plumper in Pink Lemonade – You’ll know what I mean when I say this is one of those ‘tingly’ plumping lip glosses. It applies clear and help gives lips an enhanced, plump feeling, and it also smells like lemonade! 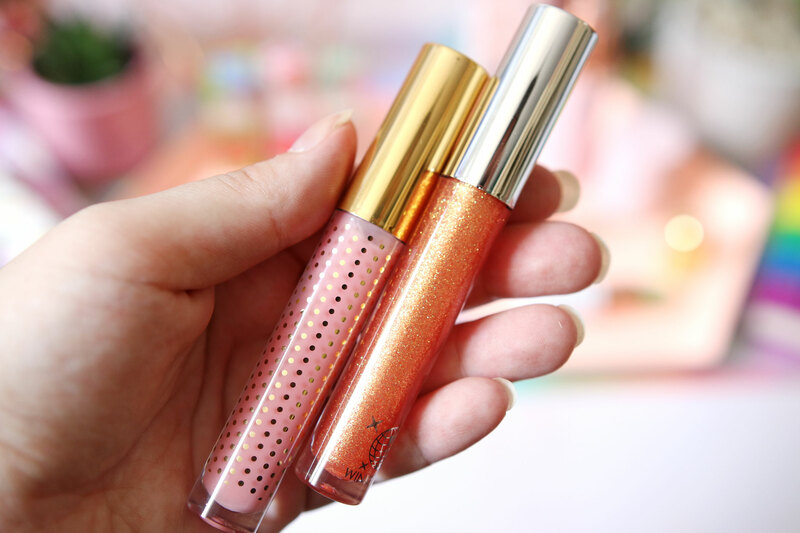 And one of the Disco Kitten Glosses in shade Foxy – this is a colour changing lip gloss that starts off as a clear base with orange-gold glitter flecks, then changes to a light pink tint when applied to the lips. I also have three gorgeous lip balms – the Flower Balm (which isn’t a new launch) is Winky Lux’s best selling lip stain. It applies on clear an instantly reacts with your skin’s pH levels, to give your lips a unique pink tint. It also has a lovely coconut scent, and contains a real Chrysanthemum flower in the centre of the lipstick. The Watermelon Jelly Balm has the same pH-activated ingredients as the Flower Balm, but this one has a gorgeous mouth-watering watermelon scent. 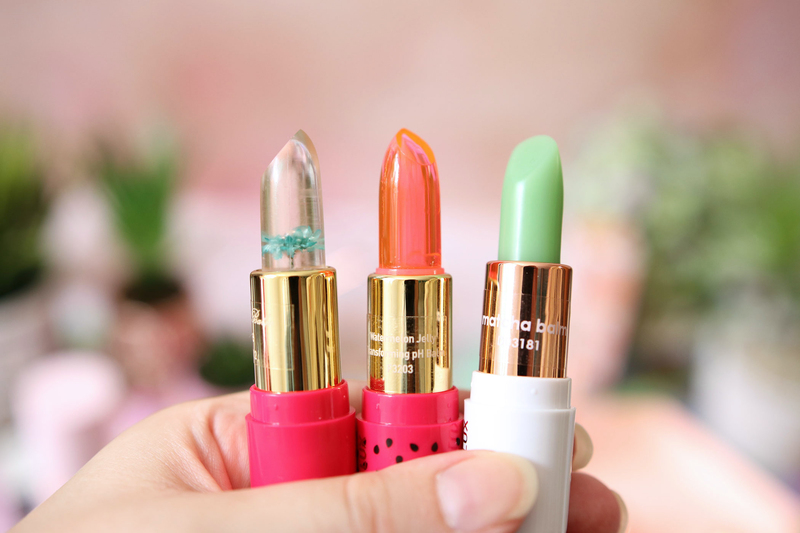 It’s essentially a tinted lip balm that just looks super cute! And lastly the Matcha Lip Treatment – this is a clear-finish, nourishing lip balm, designed to both protect and repair the lips. It contains Green Tea Powder to stimulate collagen production, Coconut Oil, which is naturally antibacterial and provides a protective moisture barrier while it nourishes, Avocado Oil which is a vitamin-packed, super food with long-lasting power, Vitamin C to help repair dry, chapped lips, and lastly Food-Grade Vanilla which makes the balm smell gorgeously edible. I’m in love with the scent of this balm, I think it’s my favourite out of the above products. I’ve used it a couple of times now and it really does leave my lips feeling amazingly soft. The above products are all available now at Winky Lux, Boots and Free People. 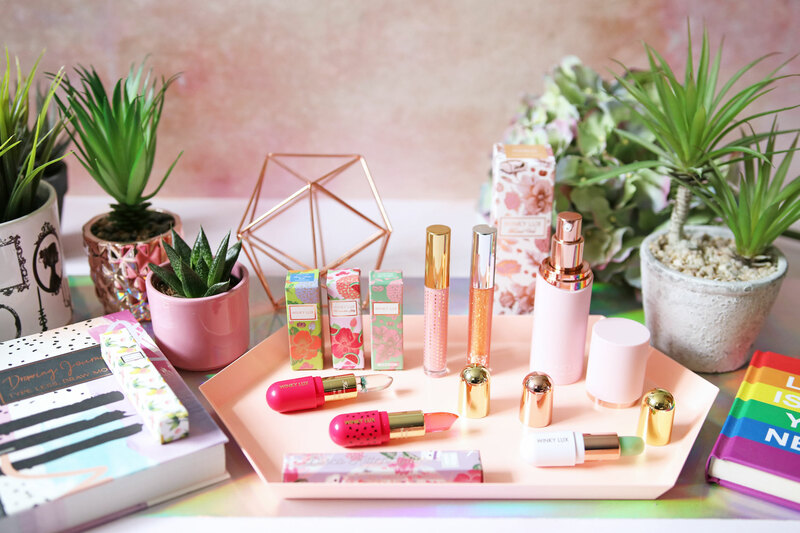 Beauty Bloggers Christmas List Collaboration!